In my last post, The 3 Squares we talked about how to find the three ways in your business that you would be focusing on to make money. 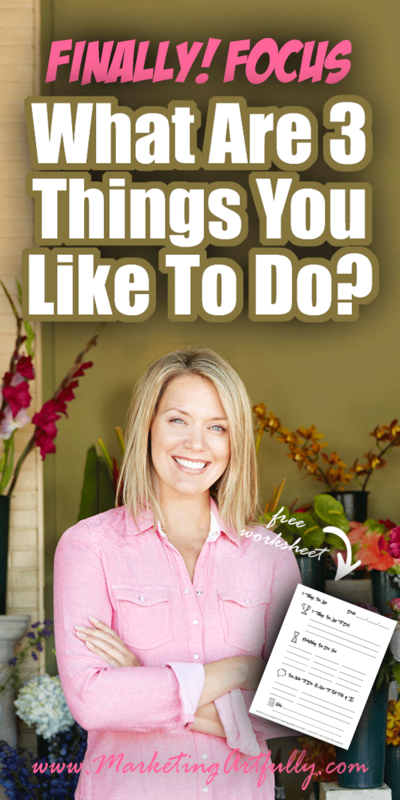 Today we are going to talk about the 3 things you personally like to do! As creative entrepreneurs we can get “shiny object syndrome” and try to do too many things all at once. By focusing on YOUR greatest strengths focusing becomes even easier! Let’s just jump right in and get started. This will probably seem like a simple question at first, but believe me, it trips lots of us. It probably took me 3-4 YEARS to figure out what I like to do and the change my business over so that is the majority of my time working now! I suggest you sit down with a pencil and paper, in a quiet space (could be a coffee shop or your home if you don’t have 3 kids and a menagerie of pets) and think about this…. If you could only do one thing, all day, every day for the rest of your life for your work, what would it be? Now this could encompass MANY different things, here are a few that I have heard over the years of coaching entrepreneurs. Rebekah… research on the internet. At this point don’t try to get all fancy and specific, just think about what makes you the most happy and write it down! Next, if you could only do one more thing, all day, every day for the rest of your life, what would it be? My second one is “make pretty pictures”. As I said, don’t get too fancy with yourself right now, but just so you know, my “pretty pictures” turned into making graphic images for my blog posts or even taking pictures myself for my product photography. Lastly, if you could only do one last thing, all day, every day for the rest of your life, what would it be? My last one is making videos. I actually love making “how to” videos to help my peeps (because I am bossy) and also recording video interviews where I am the speaker. YAY! Once you finish this, all your focus problems are solved and now you can start making more money and loving life… JOKING! 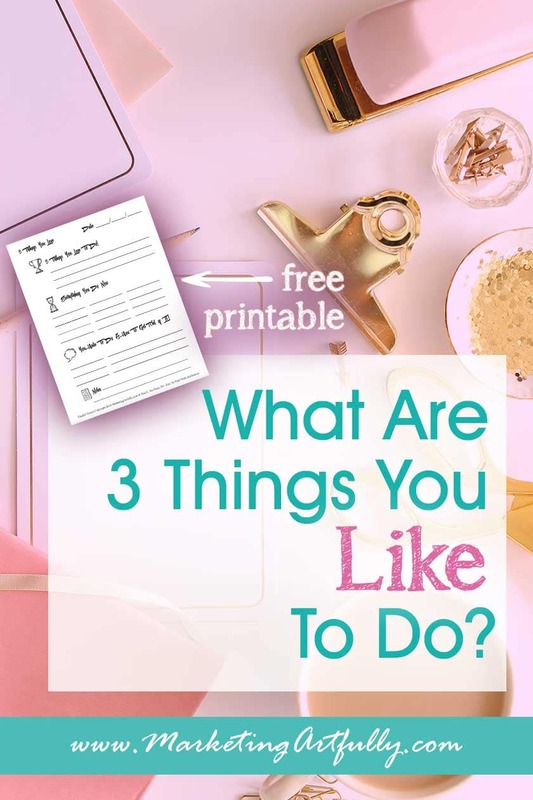 I would be willing to be that if you took a hard look at your business you would find that you are not doing one of those three things for the majority of your time. Speaking… doing LOTS of small speaking events, great for getting people in my database and getting new social media clients. Writing books… I love writing, just blogs not books. Writing a blog post a week, where I got to do ONE pretty picture. Thinking I needed to do a podcast, make courses, do small group coaching, working with only Realtors, blah, blah, blah. So now, write down what you do in your work everyday. If you are brave, keep a log for a week and be super strict about writing everything down! What almost everyone who has ever done this has found is that their weeks are full of other people’s problems and expectations! Why Don’t We Do What We Love? This is a major question that comes up time after time. As women (men are a wee bit better at this than we are) we have this weird, built in thing that tells us if we love doing something it can’t be WORK. If we love learning new things, that can’t be part of our work, with structured time set aside to do it. If we love writing, then it must saved for “special” times when we aren’t doing our “real” work. If we love talking to people, that can’t be the thing that helps us make the most money, everyone says you have to work on the computer now. I don’t know how these weird rules get in our heads, but I have seen it time and time again. Work can’t the thing we love because then we would be “cheating”. But I am here to tell that doing what you love shows through. You are more motivated to do great things. You can jump out of bed and be excited for your day. You can FINALLY spend your time doing things you love!!! I don’t like being the person who organizes things like guests, topics, etc. Nowhere did I say one of my favorites was setting up technical bits. I like videos and do them easily, podcasting is not my jam. But every time I hear a podcaster talk about rocking it and how it changed their business, I think… maybe I should try it…hmmm. So even if I could do it technically, I would not be promoting it much. I would be dreading having to contact guests and then the stress of actually talking to people. There is just not much about it to love for me. Every “shiny object” that distracts you from the things that you love doing is wasting time that you just don’t have as a entrepreneur!! Last but not least, think about what you don’t like to do. I have been telling my mastermind partner for YEARS that one of my goals is “no client work” and I am almost there! At this point there may be some things that you don’t like to do, but still need to do financially, that is okay! What you don’t want to do is keep taking on projects and challenges that include those things that you don’t like. Be super vigilant that you only opt in to doing things that match top three things you like to do! So what about the things you don’t like to do? Okay, let’s call a spade a spade, I don’t LIKE to do my bills but I can do them. I HATE doing my accounting so I farm that out. Depending on where you are in your business will determine how much you can outsource work that you hate. That said, oftentimes we do things that don’t need to be done. 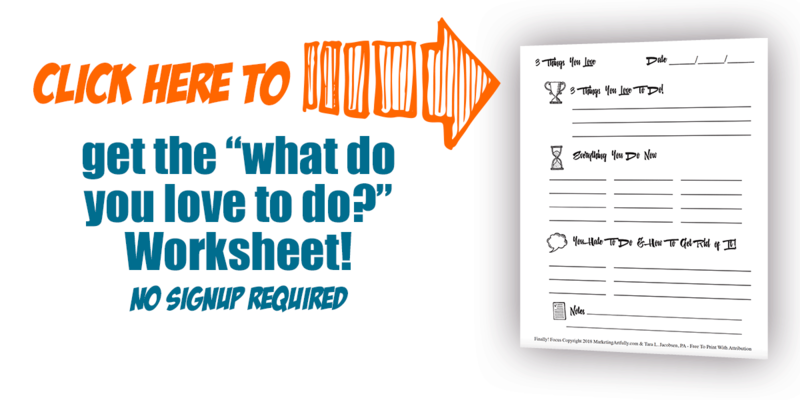 See if you can eliminate anything that isn’t vital to your business!